The augmented-reality game is making America a friendlier place. It’s carving out common ground between the races and the sexes. It’s giving couch potatoes a welcome reason to go outdoors. It overwhelmingly appeals to the Millennials who grew up on Pokemon. It’s a time-eating addiction for some, but not most. People love that it’s free; just a few are spending for extra features. It isn’t going away any time soon. 74% of respondents said they prefer playing with others over playing alone – even though nearly as many – 70% -- consider themselves introverts rather than extroverts. 52% said they’ve made new friends or acquaintances playing Pokemon Go. 54% said they started playing partly because friends were playing. 34% of all respondents said they never had played a Pokemon game before. But even more African Americans and Hispanics/Latinos are embracing the franchise for the first time because of the new app. 49% of African Americans said Pokemon Go is their first Pokemon game. 40% of Hispanics/Latinos said the new app was their introduction to Pokemon. 32% of Caucasians said they are newcomers to Pokemon. 31% of Asians said the same. 47% of females said they’d never played Pokemon before getting the new app. 21% of males said the same thing. 50% of respondents were male, 50% were female. 83% of respondents were ages 18 to 34. 14% were 35 and older. 2% were 13 to 15 years old (the youngest bracket surveyed). 50% said they spend no more than 60 minutes a day with the app. 20% said they spend less than 30 minutes a day. 28% said they spend one to two hours daily. 22% spend more than two hours a day. 74% said they’ve only played for free, spending nothing. 26% said they’ve spent on extra Pokemon Go features. 90% of the spenders said they’ve spent $20 or less. 62% of the spenders said they’ve spent $10 or less. 2% said they’ve spent more than $100. 13.6% said their favorite Pokemon Go character is Eevee. 7.8% picked Pikachu, the most widely-known Pokemon. Six other Pokemon were favored by 1% to 2% of players. The survey was carried out with MFour Mobile Research’s Surveys on the Go® app, combined with its App Tracker capability, which allows MFour to monitor which apps the Android users among its panel of more than a million survey respondents have downloaded. Data reflects the geographic and demographic population distribution of the U.S. The survey was conducted July 13, fielded to the mobile devices of Android users who’ve downloaded Pokemon Go. Results reflect data from 1,000 completed and validated responses. Respondent demographics: 50% male, 50% female; 65.6% Caucasian; 13.4% Hispanic-Latino; 7.6% African American; 6.8% Asian; 1.6% Native American-Alaskan; 0.9% Middle Eastern; 0.6% Pacific Islander; 3.5% Other. 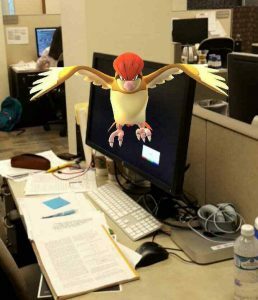 Photo: one of many received by MFour from survey-takers in our Pokemon Go study.